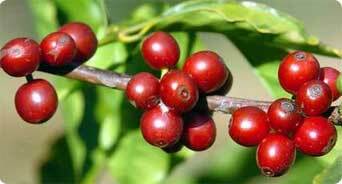 One coffee tree yields less than 18 ounces of coffee per year. 1.4 billion cups of coffee are enjoyed every day around the world. Black coffee with no sugar contains zero calories. Scientists have discovered more than 800 different aromatic compounds in coffee. George Washington invented instant coffee. Not the president, but a Belgian by the same name, in the year 1906. 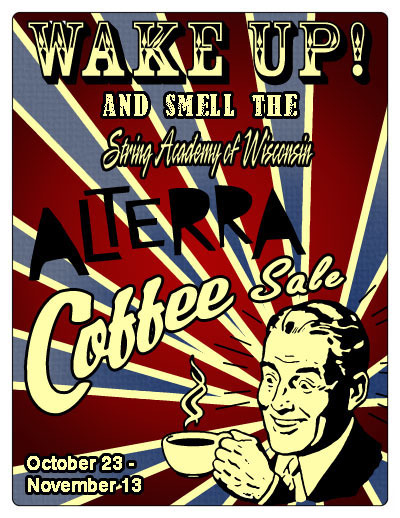 The String Academy of Wisconsin’s Alterra Coffee Sale runs from October 23-November 13th! It’s a great way to support the String Academy. Contact a friend or family member from the SAW or Heidi in the office to place your order. See what delicious things you can buy after the break…. Coffees Breakfast Blend – $12/lb. In order for a blend to earn the distinctive “Breakfast” title, it must be a coffee that one can consistently count on to start the day in a delicious way. Our blend of certified organic and Fair Trade Certified coffees from Nicaragua, Guatemala and Sumatra do just that. Enjoy! French Roast – Organic/Fair Trade – $12/lb. Fans of dark roasts, listen up! Our version of the classic French Roast – Organic/Fair Trade was created just for you. Dark-roasted versions of our FTO Timor and Sumatran coffees come together in this smoky, full-bodied blend. Flavors of dark chocolate, gingerbread and black licorice reward those who aren’t afraid of a little roast in their lives! Decaf Dream Harder – $12/lb. As fellow sleepers, we recognize coffee can keep a person up nights. We admit it. Time spent tossing and turning should be time spent dreaming. To this end, we created Dream Harder Decaf. Slightly dark roasted Decaf Colombia Supremo blended with a lighter roasted Decaf Sumatra makes it possible to both enjoy coffee and get the most of your restful hours. Alterra Cocoa and Tea Hot Cocoa: Regular or Mint – $6.50 /12oz Tin We use pure Ghanaian cocoa beans (considered to be the best in the world) to produce a hot cocoa mix with a rich aroma and a magical flavor. It’s great on its own or in your favorite drink. This is the same cocoa mix that our café customers have been enjoying in mochas and more for years! Our mint cocoa is the same as our regular one with the addition of all natural mint to help create a smooth flavorful drink you are sure to love. Chamomile Lavender – $6/tin Fruity Egyptian chamomile is blended with the delicate flavor of lavender to produce a caffeine-free cup that is sweet, golden, and lightly floral. Chamomile has long been known for its calming qualities and aids in digestion. Try it sweetened or enjoy its simplicity unfettered. Irish Breakfast – $10/Tin Composed of strong, full-bodied teas from China & India, our Irish Breakfast is just like a tea you might sip while visiting the Emerald Isle. Milk and sugar are pleasing additions to the robust, malty flavor of this blend. Minty Green – $9/Tin Refreshing and fragrant peppermint leaves are the perfect complement to the honey-wheat flavor of artfully toasted green tea. This is our take on a Moroccan classic that’s great for everyday sipping. I would teach children music, physics and philosophy: but most importantly music and all the arts are the keys to learning.